One of the most difficult situations to be in is trying to figure out what to say when you want to break up with someone. Most people who experience a break up are in pain - saying the right things can help make it easier. In some ways, it's easier to break up with someone if the person has done something awful to you. If your partner cheats on you, you have a perfect excuse and no need to justify your decision to end things. However, life isn't always that cut and dried. Sometimes the signs of a relationship breaking up are more subtle and harder to understand. Sometimes you don't even know why it is you are breaking up - you only know you have to. There are a few communications strategies that will help you know what to say when you want to break up. "I feel like it would be best if we ended our relationship." "I have not been feeling fully satisfied in this relationship and think it would be best if we broke up." "After some thought, I think we should end our relationship." "I no longer want to continue our relationship." "I don't feel the same way about you as I used to." "This relationship isn't fulfilling my needs anymore." "I am not comfortable staying together knowing that we are on two very different paths." "I don't feel right continuing a relationship that I can't see making it long term." "In thinking about our future, I don't think we are compatible in the long run." "I am having a difficult time communicating my needs to you, and think it would be best to work on myself." "I don't think our relationship is healthy for me to continue being a part of and think we should break up." "I am feeling hurt by many incidents that have occurred throughout our relationship and think it would be best to move on." "I do not feel confident in our relationship succeeding going forward." "I no longer feel happy in our relationship and think we should break up." What is most important is not necessarily what you say but rather how you say it. When you're breaking up with someone, you both will likely be in a lot of pain - so try very hard to say things as kindly as possible. 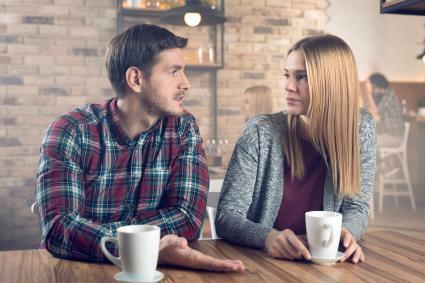 If you can keep from lashing out at your partner in a defensive reaction, you will be much more likely to come to a mutual understanding of why the break up needs to happen. That will help you both move on and leave your relationship to become a fond memory rather than a deep scar.